The Wiggles Rock and Roll Drum is one of those toys that you know will be an instant hit (sorry, no pun intended) with toddlers - they always like bashing things and making a noise. 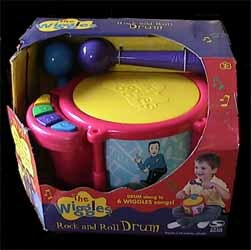 Well, you'll be on a roll (sorry, another unintended pun) with this Wiggles themed musical toy. I'm sorry to bang on (oops! I just can't help myself) about this, but the Wiggles range of musical toys are fantastic value for money. While this item may not provide the same sort of creative freedom as the Dancing Keyboard, it will help to create an all important early sense of timing in toddlers. 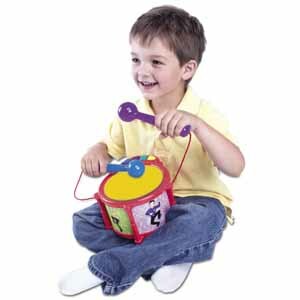 Toy drums must be one of the oldest children's products on the market - even our editor used to have one as a child... and he's ancient - so it's great to see that this old classic has been updated for today's toddlers. The drum has four brightly coloured buttons. Three of these play two different songs each, while the fourth button plays one of six different drum beats. The six songs include short sound grabs of Boom, Boom; Five Little Joeys; Swim Like a Fish; Listen to the Drummer Playing; Tick Tock (All Night Long); and I Wave My Arms and Swing My Baton. Thankfully, the songs are not long enough that they will start to get on your nerves after repeated listening - in fact, some of them are quite catchy. Yet another great addition to the range of Wiggles musical themed toys.